It's not pretty, but SampleRobot Pro and WaveRobot are brilliantly effective for automatically sampling MIDI-triggered instruments and electric/acoustic ones. Includes WaveRobot editor. Makes instrument sampling easy. Lots of sampler export formats. Up to 128 velocity layers. If you've ever tried multisampling a real synthesiser (or any other instrument), you'll know it can be tricky. After creating a MIDI sequence containing every note you intend to capture, the resulting samples may need to be trimmed and have loop points assigned. Then you'll need to name them sensibly, possibly add metadata, and map them out in a sampler. SampleRobot is a standalone app that automates most of the above process, potentially shaving hours off the job. Version 5 improves on v4 with more sampler formats to export to, up to 128 sample layers per project, performance optimisations, and support for the current versions of Mac OS X and Windows. If you have two computers, you can run SampleRobot on one and a virtual instrument on the other, connecting the second computer via audio and MIDI for capture as if it were a hardware synth. Some audio interfaces even have the ability to capture their own output, so you'll be able to capture an instrument on the same machine (using a virtual MIDI cable). It all begins with the interactive Project Wizard, which walks you through the creation of a SampleRobot Project - basically, a file that stores all the information required, such as keyboard range, multisample layers, loop settings and MIDI/audio interface ports. The Project Wizard starts by asking you to specify the audio input device, followed by the sampling frequency and bit depth (from mono 11.025kHz, 8-bit, to stereo 192kHz, 24-bit). Next you choose between Automatic and Semi- automatic Recording. In Automatic Recording mode, SampleRobot spews out all the relevant MIDI instructions to capture your MIDI gear without further human intervention. You select the relevant MIDI ports, channel and program number (if applicable), then set the number of keys to be sampled, from 37 to 128, and decide how many velocity layers and Key-Steps (the interval between sampled notes) you want. You also specify the Note Length and Release Length, and whether or not to use Auto-Loop. Finally, set the position of the loop start point, either 30%, 50%, or 70% into each note. With the Project Wizard complete, SampleRobot estimates the duration of the recording process and the size of the resulting sample data, before entering the main interface, where you can review/tweak your settings and click Start Recording when ready. Once the wait is over, you can play your captured instrument (via MIDI, or the software's interface) and edit loops and crossfades with the WaveRobot editor. Semi-automatic Recording mode, meanwhile, is for non-MIDI instruments, which need to be played note-by-note, with a tuning oscillator confirming if you're playing the right notes. We can safely say that SampleRobot does everything it's supposed to do, and does it well. Our only gripe is that the main interface is too small and doesn't look very nice, but that's not going to be a huge concern when your goal is to produce sampler patches - and you'll spend most of your time using the Wizard anyway. 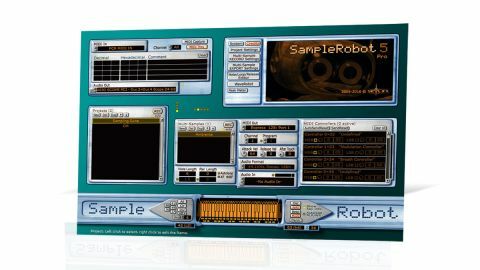 SampleRobot Pro 5 will appeal most to soundware content creators, of course, but if you're a musician looking to perform live without lugging a ton of hardware synths around or reduce your system overhead by rendering CPU-intensive soft synths, it has the potential to make your life much easier.